The “replace” part of whatever plan Trump and Ryan produce will surely attack the fundamental idea of a right to health care. The Affordable Care Act’s shortcomings are well-known, and this magazine hasn’t shied away from editorializing about them. The law didn’t attack the fundamental flaw in our system: We still treat health care as a commodity, rather than as a public good and basic right. A Medicare-for-all plan would have better controlled costs, reduced complexity, and left workers free to choose better jobs without losing access to their doctors. The Democratic Party consensus now holds that, at minimum, Congress must finally add a “public option” to Obamacare’s private-insurance markets. Of course, Republicans have no intention of improving the law, and defending against its wholesale repeal is one of the preeminent tasks in front of progressives in the weeks ahead. So it’s crucial that we understand two realities about the fight we now face over health care. Medicaid ‘reform’ may become the tip of Paul Ryan’s spear. First, Obamacare did radically reform the market-based system. 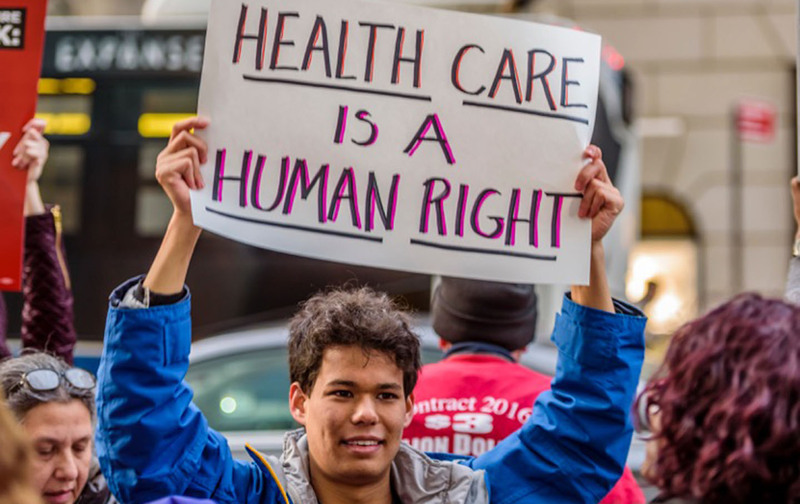 It has made coverage possible for more than 20 million people and cut the uninsured rate by nearly half, while ensuring everyone can get the preventive care that prevents or treats heart disease, diabetes, breast cancer, and other entirely avoidable killers. Racial disparities once considered intractable have shrunk, and 2.3 million people under the age of 26 have gained insurance through a parent’s plan. But here’s the key point to understand about all of this: The law achieved this massive reformation largely through public investment in the working poor. Yes, premiums have gone up as insurers have tried to figure out how to profitably cover all of the people they used to legally dodge (such as people with dementia, those battling opioid addiction, and even pregnant women—a list that encompassed more than 52 million people in 2015). But more than eight out of 10 people who have bought insurance in each enrollment period thus far have done so using subsidies. In 2016, seven out of 10 marketplace consumers paid $75 or less a month after their subsidies were applied. Millions more now qualify for Medicaid in states that once denied them help. Through this public investment, the law allowed millions of workers to escape a devil’s choice of modern capitalism. The poverty wages that many employers offer and the expanding gig economy left millions of people too poor to get adequate health coverage, but too rich to get help from the safety net. You could choose work, or you could choose health. Obamacare created new choices. Medicaid “reform” may well become the tip of Ryan’s spear. Mike Pence was one of 16 Republican governors who opted to join Obamacare’s Medicaid expansion, but he agreed to do so only if he was allowed to introduce a reform idea that Republicans had long sought. The Obama administration, in its effort to get all 50 states on board, allowed Pence and other GOP governors to begin making Medicaid enrollees pay some portion of the bill. This shift has the potential to rewrite Medicaid’s DNA. The program represents a consensus that if you are too poor to pay for care, you still have a right to receive it. For decades, Republicans have searched for ways to undermine this consensus, as they achieved with welfare, in partnership with the Clinton administration. The “replace” part of their repeal effort offers the vehicle they’ve lacked. Notably, the person who ran Pence’s Medicaid program in Indiana, Seema Verma, is slated to run Trump’s Centers for Medicare and Medicaid Services. Even without a repeal, Verma will have the rule-making power to both entice states to follow Indiana’s lead and punish those that don’t. The stakes in the coming weeks and months are far greater than Obamacare alone. There are signs that many progressives already understand the threat. For years, the Obama White House has assembled impressive statistics in its defense of the Affordable Care Act. But even so, it has steadily lost the narrative war. Too many Americans who benefit from the law don’t know that they do, and too many believe that it’s responsible for driving up costs (it isn’t). That dynamic may finally be changing. Led by Senator Bernie Sanders, Democrats have held more than 70 rallies across the country featuring Americans who were saved from bankruptcy or death by the ACA. Some of these rallies, like the one headlined by Sanders and Senator Chuck Schumer in Macomb County, Michigan (which went for Trump after voting twice for Obama), drew thousands. Others, like the one in Allentown, Pennsylvania, where Stage 3 cancer survivor Brian Kline testified that Obamacare saved his life and his livelihood, drew smaller crowds of a few dozen neighbors. Cumulatively, this late outpouring of stories may finally be having an impact: For the first time since its passage, more Americans say Obamacare is a good idea than a bad one, while 50 percent say they have no confidence in Republicans to replace it. Over the Martin Luther King Day weekend, Republican Representative Mike Coffman walked into a routine constituents meeting in Colorado’s Sixth District and met an estimated 200 people demanding to speak with him about his support for Obamacare’s repeal. When he refused to meet with each of them, they began chanting in the hallway. Coffman slunk out a side door, captured in his retreat by a local television station. In the summer of 2009, as Congress debated the ACA, House members around the country were surprised by similar protests. The moment is widely credited with stopping the momentum for a more ambitious version of the law and fueling the Tea Party fire of the 2010 elections. May we say the same about the progressive surge of 2017.